If you’re a teacher in New York state then you know that summer recess has only just begun. Spending the last Thursday before the end of school with Chris Lehman was an inspiring way to close out the 2016/2017 year. On June 22, 2017, we concluded another year talking more about how to question rather than dispensing answers. 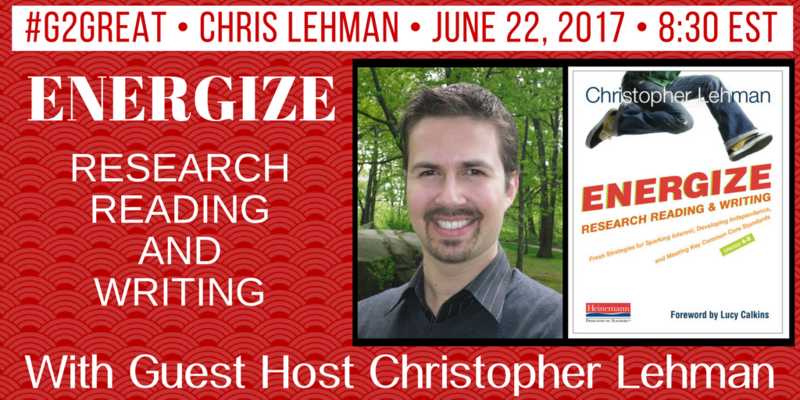 We celebrated this ideal by diving into a thoughtful conversation around Chris Lehman’s wonderful book, Energize Research Reading and Writing. After all, this is at its core, what #G2Great is really all about; loving the questions and welcoming the search to know more. 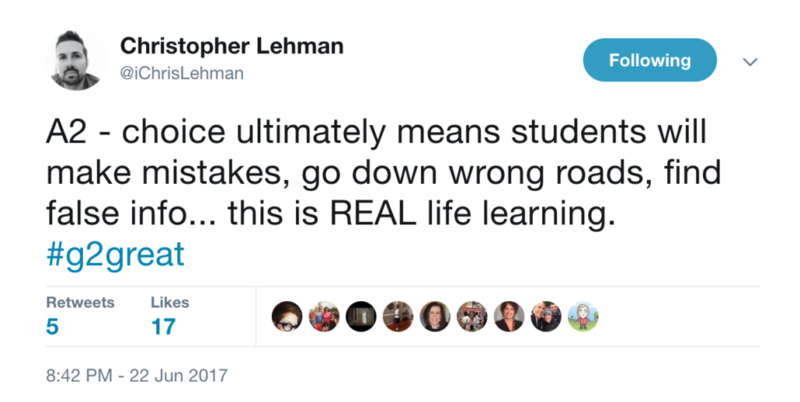 Chris Lehman’s message extends beyond research to every aspect of teaching and learning. What does curiosity look like in the classroom? Is it the competition? Emerging victorious? Or just the knowledge that if you win the Super Bowl that you are the world champions? Saturday I had the opportunity to try on two championship rings at a football event: Marshall Yanda’s and James Ferentz’s rings. 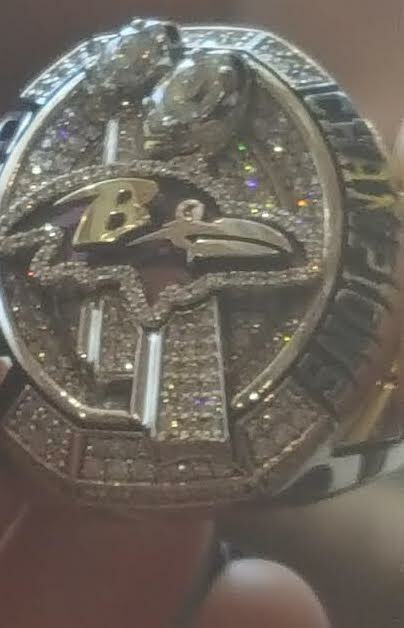 Each ring is as unique as the team and the player. They are huge personalized outward symbols of a world championship team member. On my ring finger, this covered both of my joints and was filled with glitz, sparkle, and a weight that emphasized its success! What’s the symbol of LEARNING in your classroom? 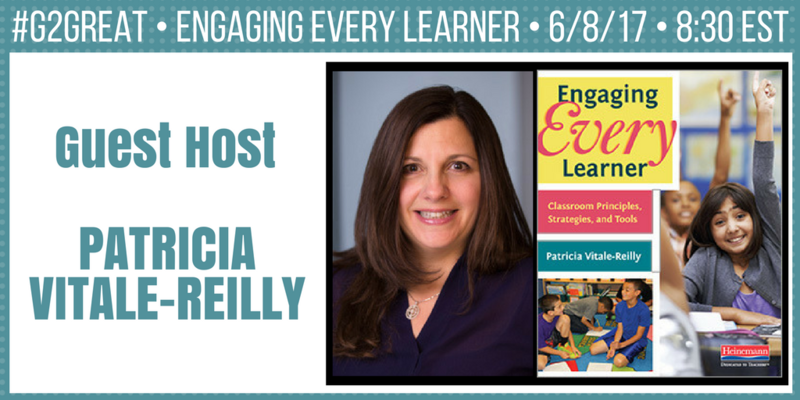 If you were present for the June 8, 2017 #G2Great chat with Patty Vitale-Reilly you know that the @HeinemanPub team has an absolutely world championship team assembled and one of their veteran authors has won her own world acclaim with Engaging Every Learner: Classroom Principles, Strategies and Tools. This text provides an indepth look into the steps needed to truly embrace a culture that engages every student. The link above will take you to Heinemann and ultimately a free copy of the introduction and Chapter 6. If you are a teacher, coach or administrator you will want to read this book and study the ideas that Patty presents as well as follow @pattyvreilly on Twitter. What makes this a championship book? Why is engaged student learning important? 2. Cultivate engagement in the classroom; don’t teach it! I am a firm believer of “begin with the end in mind”. 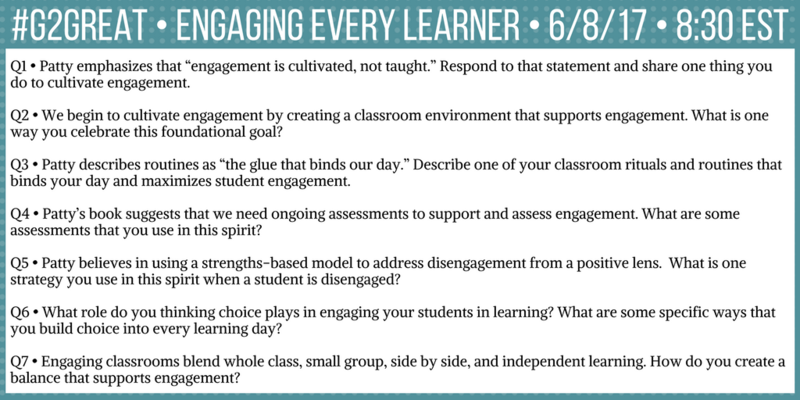 What is the question you have about student engagement in your classroom? How are you building that championship culture? 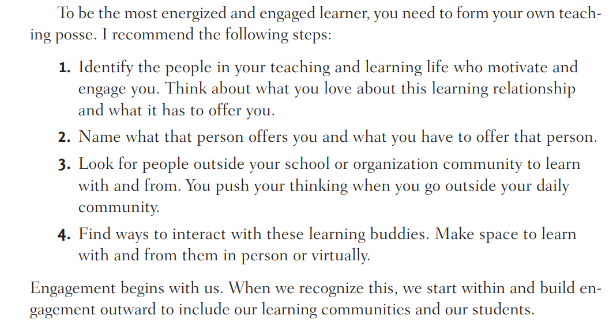 Do you need to begin with the sixth action and assess your own use of your posse and your engagement in learning? Or do you need to begin at the beginning in order to learn more about the behavioral, emotional and cognitive environments? Each book chapter includes a checklist that will help you prioritize your needs. Please build your own mini-action plan to cultivate engagement in all aspects and for all students, as well as yourself! Heinemann blog with Patty: How Can You Adjust Your Classroom Environment to Maximize Engagement? 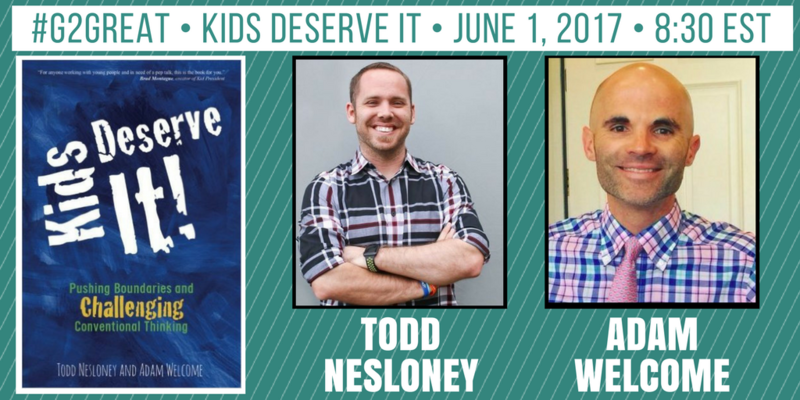 #G2Great enthusiastically opened our door on 6/1/17 to welcome guest hosts Todd Nesloney and Adam Welcome, co authors of the magnificent book, Kids Deserve It: Pushing Boundaries and Challenging Conventional Thinking (Dave Burgess Consulting Inc). 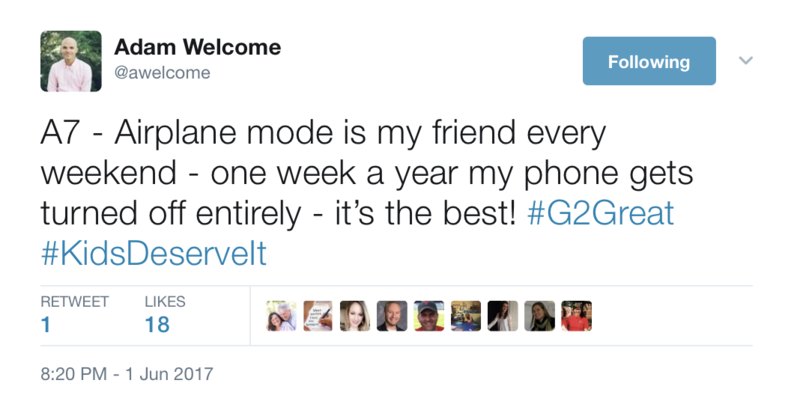 I was personally over the moon elated to have our guests in the #G2Great house and judging from the tweet frenzy that ensued, my excitement was shared by many. To my delight, my status as captive audience lingered from cover to cover as I found myself joyfully anticipating the repeated phrase that ended each chapter – because kids deserve it! On that first exuberant reading, I scribbled happy notations lovingly across now dog-eared pages and still frequently revisit those words for renewed inspiration. Our #G2Great chat with Todd and Adam elevated my Kids Deserve It lovefest and made me appreciate those three magical words even more. And so in honor of our guests, I’ll borrow their inspired phrase to share six powerful ideas that permeated our #G2Great hour with Todd and Adam as we heed their challenge to avoid complacency… Because Kids Deserve It! I am so grateful to live in an age where we have been afforded incredible opportunities to step beyond our own spaces so we can expand our circle of dedicated others. Becoming connected allows us to join forces in ways that were never available to me when I began teaching in 1972. With the gift of social media literally at our fingertips, being connected is not just an opportunity but also a responsibility. 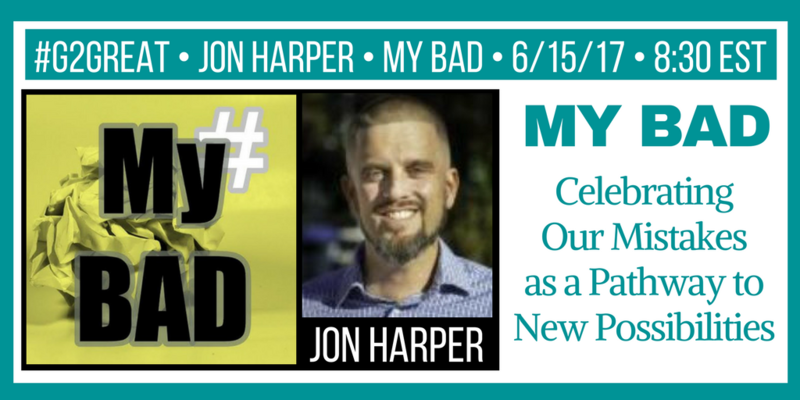 During the chat, we each exchanged our personal fears that once thwarted this brave shift as connected educators and the realization that those fears were unfounded in reality. We each acknowledged the impact of social media in our lives and the generous support of other connected educators who have elevated our day-to-day professional efforts through thoughtful collaborations. I often reflect on how much I’ve grown as an educator over the past 4 ½ decades. While I certainly celebrate my growth process, it is actually how much further I have to go that inspires me most. We have a myriad of options to support our growth journey (social media, reading, dialogue, webinars) and choosing from these options demonstrates firm commitment to increasing our own knowledge base. That base includes our knowledge of research and the practices that enrich our teaching but we also recognize that this knowledge will only come to life where it matters most when we know students. This combined knowledge allows us to determine the best possible practices for each student at any given time. Professional knowledge is crucial, but keeping knowledge of students in our sights allows us to apply these understandings in responsive ways. Being present in the learning moments that surround us became a familiar theme across the entire chat discussion. Todd and Adam helped us honor the relationships that form the foundation of our work but they each turned our attention to these relationships from multiple perspectives. Todd reminded us to listen more than we talk as we seek to understand the viewpoints of others. Adam highlighted the power of meaningful dialogue driven by our curiosity about children and unbridled determination to move students from where they are to where they could be as we honor the same for ourselves. Listening and thoughtful talk helps us to be present in those moments so that we can do our best work for our students because we know that everything we do is an opportunity to consistently and purposefully make student success our priority. 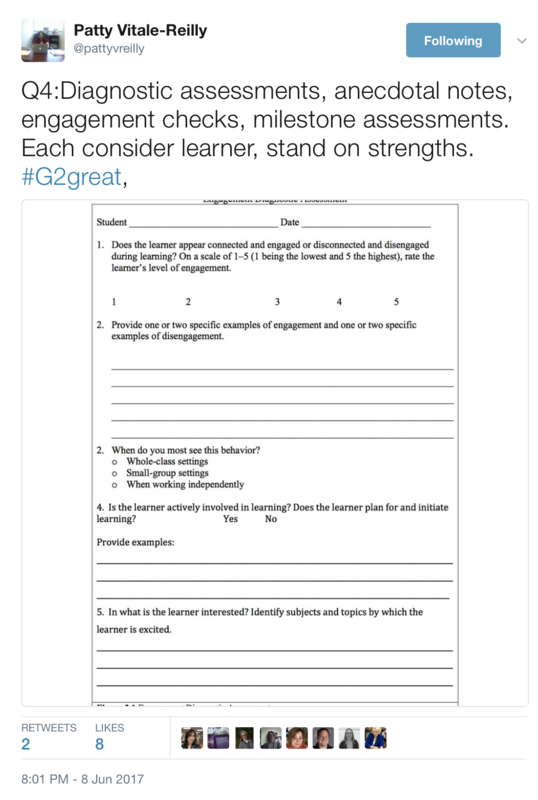 One need only spend a few minutes on Twitter chats like #G2Great to recognize the potential for celebrating inspired learning from our own lens and from that of our colleagues. Whether we are working to build relationships with our students or with our peers, the focus and outcome are the same. We begin by noticing the many amazing opportunities around us and then intentionally celebrate those noticings as we honor them for ourselves and others. Over time, our celebrations become a habit of mind that can only survive in a schoolwide culture grounded in mutual respect. It is this genuine respect for our children and for each other that has the potential to take us to a whole new level and we embrace these opportunities wholeheartedly. 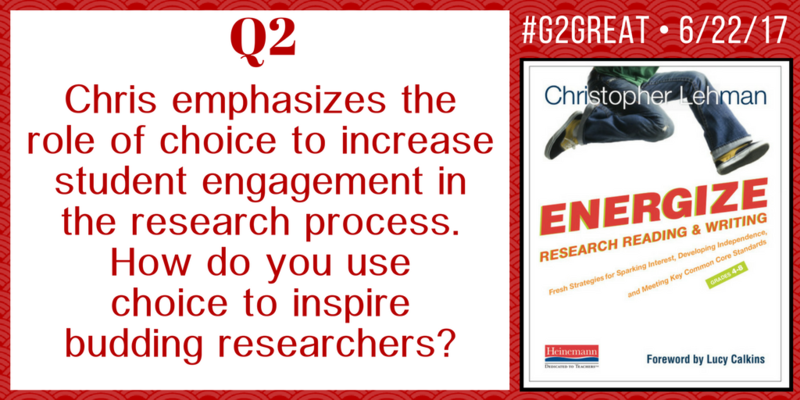 Everyone who participated in our #G2Great chat recognizes the value of connecting but as the chat continued, disconnecting began to loom large as a counter point. Teaching is fulfilling but it can also leave us riddled with doubt so we refill our life buckets as we turn those celebrations inward by giving equal attention to our personal lives outside of school. This may require us to turn off technology but more importantly it means that we take the time to turn off our minds and embrace quiet moments with family, friends, nature or whatever may personally renew us. We are the sum total of our professional and personal lives so we cannot allow one to blind us to the other. Perhaps one of the most important points in my mind that came from this amazing book by Todd and Adam and also from our chat discussion is that we can never give up – not on children and not on each other. While there will certainly be children, educators and events that challenge us and fill us with self doubt, we choose to move beyond those challenges by finding supportive others who will inspire and support us on our mission to avoid roadblocks as we “persevere, push the envelope and fight the fight.” Each of us may do this in our own unique ways, but we have a common commitment to hold tight to our vision no matter what roadblocks may stand in our way so that it will not impede our efforts to give our students the best possible education. 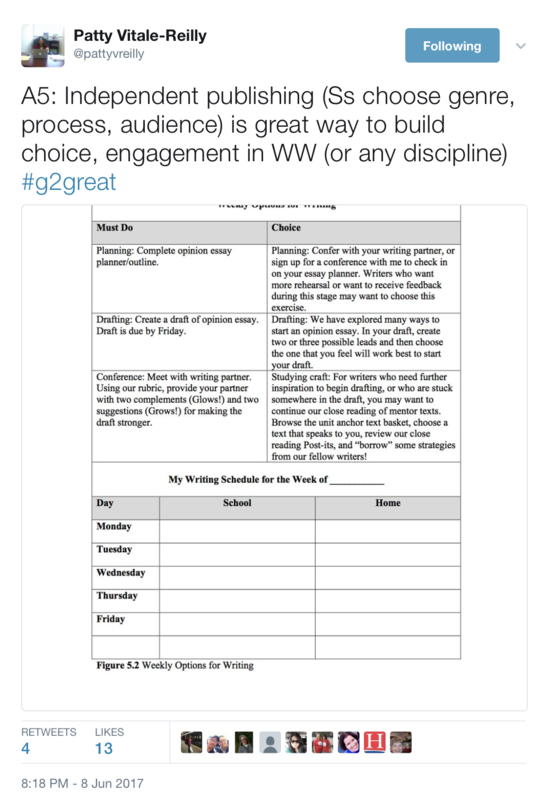 Since this week #G2great celebrated the message of Kids Deserve It, it seems fitting to end with two messages Todd and Adam released to the world within the last 24 hours of writing this post. Their words tie this post together and re-energize our commitment to do this remarkable work because kids deserve it. Thank you for keeping those words at the forefront of our minds Todd and Adam!